In our last blog, we explained how changing market dynamics should be carefully considered by would-be late summer sellers who might be tempted to put off their home sale until the New Year, in the hopes of even better future returns. It’s probable that we’ll see more active sellers this fall and winter, due to uncertainties about what’s going to happen to the homes market in 2019. Whenever a market shows signs of change, home pricing comes under a lot of scrutiny, most of all by buyers. It’s reckoned that home prices have been climbing at roughly double the pace of wages, which is of course not sustainable and is likely to lead to price correction in the coming months. Exactly what that level of correction will be remains to be seen, but this makes it very important that your listing price is finely tuned to present market conditions. A home should always be priced “in the market” in order to attract buyers. Clearly there is growing price sensitivity out there and it can therefore be all too easy to overprice the property and to consequently not receive much interest. A properly priced home will attract more initial inquiries and, as buyers are still very keen to purchase, this strategy can still lead to multiple offers and a sold price that’s above what was originally asked for. It’s essential, therefore, that you team up with the right agent. At Hyland Schneider, we lead the Prescott area in sales performance, meaning that we actually sell more homes than anyone else (we sold a home every 33 hours in 2017!). 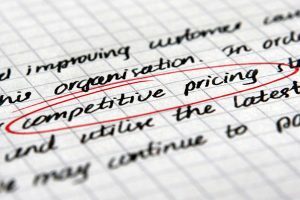 This puts us in a unique position, locally, to be able to monitor pricing trends, literally on a day-to-day, hour-by-hour basis. Listing with us ensures that your home will be priced optimally to attract the maximum amount of interest from potential buyers. With the market clearly in a state of change, pricing is likely to be a much more dynamic aspect of real estate as we move forward. Price too highly and buyers will look elsewhere. You equally don’t want to price too low, either, as that is unlikely to result in maximized returns. As an initial stage, why not contact us at Hyland Schneider team at 928-445-2100 for an informal discussion about how to price your home correctly to suit current and likely future market trends.